This take one. I worked it on Size 5's in the rnd. I chose ribbing for the bottom part thinking that it would help alleviate the need to decrease for waistshaping and help make it more form fitting. I tried it on at the point you see you here. It doesn't look bad. But it doesn't look good. The bottom edge fits alright, but the ribbing wasn't doing a good job with waistshaping. 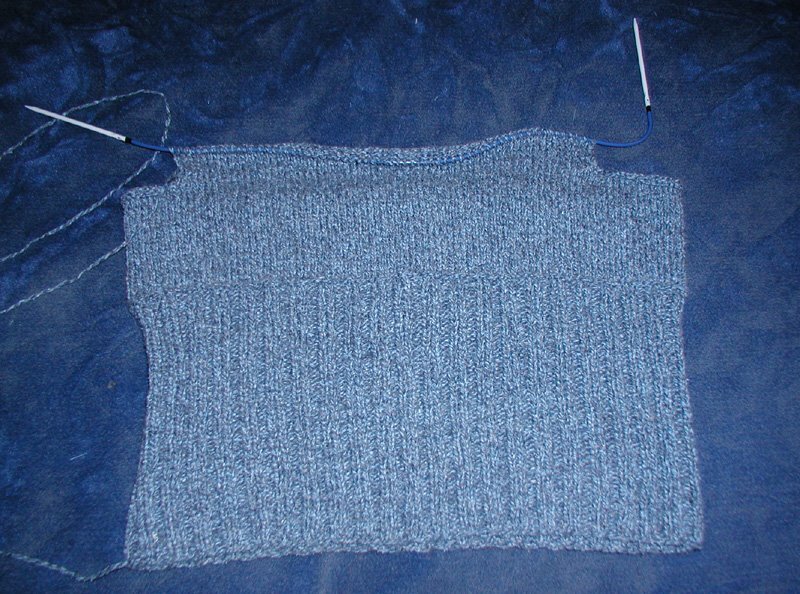 So I frogged back into the ribbing and started knitting on Size 3's thinking that the change in needle size would shape the waist, again, w/o having to dec sts. Wrong. I'm decreasing stitches now on Size 5's. We'll see how that works. I'm getting bored with this. I think it's time to move onto to something I have a little more confidence in finishing before the season is over. This is take two on the pattern pieces. The first try I didn't give myself any ease, and I realized rather quickly that a skintight garment wasn't what I was going for. Luckily, I only cut out one piece. I had enough fabric to make up for the mistake, but just enough. I can't afford anymore. But I'm confident now. 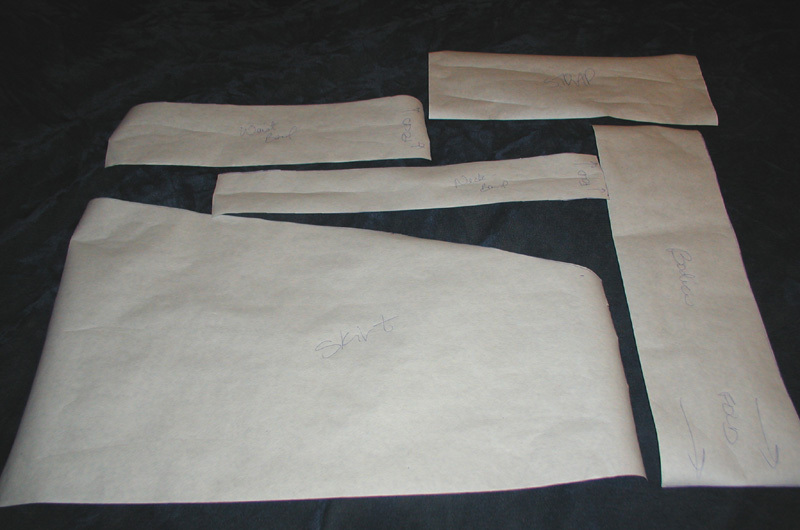 I have the pieces cut out and I drafted some directions so I don't f-up the sewing step. 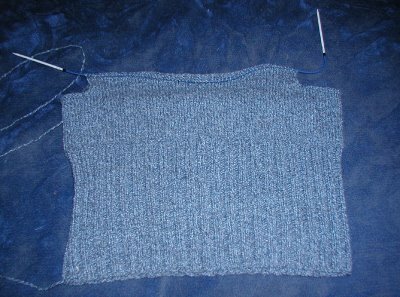 One of the major reasons why I love knitting more than sewing is that knitting is very forgiving when it comes to errors. Made a mistake? No problem, just unravel and try again. No harm done. But with sewing, you have limited fabric, you cut or sew wrong, you're pretty much screwed. Maybe I'm just not creative enough. Who knows. ETA for the Sundress- sometime midweek. (i hope). For the knitted item--go to your SNBN book and look up the section on waist shaping. I think it will help with what you're going for. The sundress--do you have any muslin fabric? Or old sheets? You might want to sew up a test garment first just in case so you don't ruin the fabric. Trust me I learned that one the hard way! When I'm patterning something to be sewn, I always do a first run in muslin. Use a Joann coupon and sometimes you can get it for under 50cents a yard! Or use old sheets, curtains, etc. I think designing requires too much brain power. I love the color of the tank. I know what it's like to get discouraged with a project. Those are usually the ones I abandon for a time and just let it be until I feel ready to pick it up again. I'm really interested to see how your sundress turns out!